VIENNA, Austria, March 28, 2011 (ENS) – As workers struggle to control the unstable Japanese nuclear reactor that was damaged in the March 11 earthquake and tsunami, the head of the UN agency that coordinates global nuclear safety today called for a high-level conference to strengthen safety measures and emergency responses. “The Fukushima crisis has confronted the agency and international community with a major challenge,” International Atomic Energy Agency Director General Yukiya Amano told a news briefing at the agency’s headquarters in Vienna. The conference would cover an initial assessment of the accident at Tokyo Electric Power Company’s Fukushima Daiichi nuclear plant, its impact and consequences. Participants should consider the lessons that need to be learned, he said. The conference would launch the process of strengthening nuclear safety and strengthen the global response to nuclear accidents and emergencies. “The work ahead will be substantial,” said Amano. 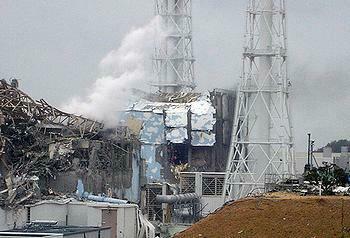 “I firmly believe that the IAEA is the best venue for follow-up on the Fukushima accident. We have the necessary expertise, extensive membership and can ensure transparency,” he said of the agency, which has 151 Member States. The current situation “remains very serious” said Amano. “The crisis at the Fukushima Daiichi plant has still not been overcome and it will take some time to stabilize the reactors,” he said. “For now, radioactivity in the environment, foodstuff and water, including the sea, is a matter of concern in the vicinity of the Fukushima plant and beyond. Current levels indicate the need for further comprehensive monitoring. On the positive side electrical power has been restored at units one, two and three and fresh water is now available on the site,” he said. It was the destruction of power lines by the quake and tsunami and the subsequent failure of back-up diesel generators to pump in cooling water that caused the nuclear reactors to overheat and release radiation into the environment. In the past week, the IAEA has put two radiation monitoring teams on the ground in Japan. On Friday, Amano took part in a video conference with UN Secretary-General Ban Ki-moon and the heads of a number of major UN agencies. “I explained that we have been working fully in accordance with the Joint Radiation Emergency Management Plan of the International Organizations,” he said. The plan is co-sponsored by 15 organizations and the IAEA is the focal coordinating body. 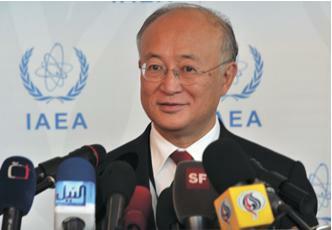 Secretary-General Ban Friday called for a stronger international nuclear safety regime in view of the crisis. “The existing institutional arrangement, including the joint radiation emergency management plan of international organizations, with the IAEA as the main coordinating body, needs to be reviewed and strengthened,” Ban said in a statement after a video conference with top UN agency officials. “I also encourage states to consider lessons learned and to adopt appropriate measures in an innovative way to strengthen the nuclear safety regime and ensure that the highest possible standards are implemented to safeguard health, food supply and the environment as well as reviewing the disaster risk reduction framework,” Ban said. In Vienna, the IAEA Incident and Emergency Centre has distributed information, channeled offers of cooperation and sent missions to Japan, said Amano, who himself traveled to Japan March 17-19. The Incident Centre is coordinating with partners including, the World Health Organization, the UN Food and Agriculture Organization, the World Meteorological Organization, the International Civil Aviation Organization, ICAO, and the Preparatory Commission for the Comprehensive Nuclear Test Ban Treaty. International flight and maritime operations can continue normally into and out of Japan’s major airports and sea ports, excluding those damaged by the tsunami, the IAEA and other agencies say. While there is currently no medical basis for imposing restrictions, the United Nations organizations are monitoring the situation closely and will advise of any changes, said Amano. Screening for radiation of international air travel passengers from Japan is not considered necessary at this time. Increased radiation levels have been detected at some airports, but these do not represent any health risk, ICAO announced. Amano will meet the UN Secretary General and the heads of agencies again later this week at the Chief Executives’ Board meeting in Kenya to strengthen coordination.